For a sport associated with global travel more than any other, most Formula 1 teams will have their shortest commute of the year this weekend when they head to Silverstone in rural Northamptonshire for the British Grand Prix. For Force India, that journey will be just a few minutes as they make the trip across Dadford Road from their factory to Silverstone. Current champions Red Bull, Lotus, Mercedes, Williams, Caterham, Marussia and McLaren are all within 80 minutes' drive of the circuit in an area nicknamed Motorsport Valley. But, given the 19 countries and five continents that the sport will visit in 2013, how did eight of the 11 Formula 1 teams come to be located so close together? "It was a combination of factors," Chris Aylett, CEO of the Motorsport Industry Association, told BBC Sport. "When World War II ended, there were many aerospace engineers [based in the area] who were used to building fast, lightweight airplanes to fight the enemy but no avenue for them to use their skills. "There were also lots of flat airfields [used during the war], such as Silverstone, and not many cars left so the engineers needed to be inventive and started building lightweight cars to race on the airfields which became race tracks. "That attracted those who wanted to race, and with them came suppliers who set up to fulfil their requirements. And when satellite television arrived in the 1980s and needed to fill airtime, motorsport stepped in and filled the role." In the late 1960s, a group of British entrepreneurs, including engineer and designer Robin Herd and former FIA president Max Mosley, started March Engineering in North Oxfordshire. They built cars for a range of championships, including Formula 1, which encouraged the good engineers to stay and attracted aspiring ones to the area. Soon enough, teams such as Williams, Brabham and McLaren set up shop close by. "The Mercedes Formula One team is designed to showcase the engineering of a car manufacturer which is often seen as a national champion of Germany. Yet the team itself is based in Brackley, Northamptonshire. The Force India team carries the national colours of India, and is funded by the Sahara India Pariwar group, yet it is based at a factory next door to the Silverstone grand prix circuit. Marussia is owned by a Russian sportscar maker, but its headquarters are in Banbury. There is a good reason for this. Although Formula One itself is very much a global sport, its centre of gravity is located firmly in southern England. Eight of the eleven teams competing in the championship are based here. 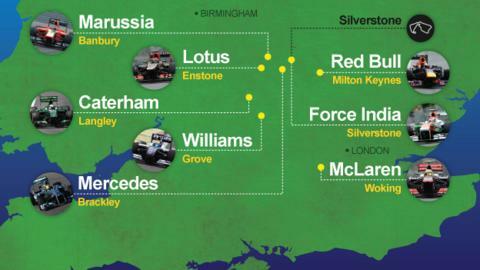 In fact, a swathe of the West Midlands and Oxfordshire has been nicknamed "Motorsport Valley". It is a centre of engineering expertise that goes well beyond Formula 1. There are about 4,500 businesses in the UK which owe their existence, at least in part, to motorsport. According to the Motorsport Industry Association, they account for nearly 40,000 jobs. However, the financial crisis has put the sector under a great deal of pressure, and many motorsport firms have spent the past few years looking for alternative ways to use their expertise, particularly in the aerospace industry." "The area around Silverstone was a handy place to be," said BBC F1 technical analyst Gary Anderson. "You could go there and do testing and it was well located in terms of major roads and airports, such as the M1 and East Midlands Airport. "If you were serious about motor racing, you had to be in that area - so teams and suppliers started to move there to form a hub of industry." With eight teams located within an hour of each other, it also means the best engineers can live in one place. "People can move teams very easily because they don't have to move house and home," added Anderson. "The downside for the teams, of course, is that while they have access to a wide pool of people, those same people can also be poached. It's tougher for teams like Sauber, who are based in Switzerland, to attract good people because it will involve a massive life change for those involved." Now almost 3,500 companies associated with motorsport are based in Motorsport Valley, employing around 40,000 people. That represents around 80% of the world's high-performance engineers. The government has latched onto this fact and continues to supply funding and incentives to encourage individuals and companies to push the boundaries of innovation in an area similar to Silicon Valley or the City of London in terms of development. In 2008, the government set aside £3.5bn in funding for transport improvements and development of centres of technical excellence. BBC F1's Gary Anderson says Silverstone is "well located in terms of major roads and airports"
"The area is encouraging inward investment and encouraging competition because if you want to stay ahead, you've got to welcome the world's best to drive performance," added Aylett. In terms of Formula 1, the big teams - such as Mercedes and Red Bull - will employ 600-700 people, while the midfield teams like Force India and Sauber will have around 300. That figure drops to around 150 for Banbury-based Marussia. The industry continues to grow, with companies in Motorsport Valley producing an estimated turnover of £6bn, of which £3.6bn is exported. Despite the economic climate, motorsport-based businesses then spend 30% of their turnover on R&D to stay ahead of the competition. That compares to 4% in engineering, 6% in automotive and 15% in pharmaceuticals. The results are clear to see on the race track with 17 of the 20 races in Formula 1 last season being won by a British-built car. British-based constructors have won 38 constructors' championship since F1 began back in 1950, well clear of Italy (16) and France (1). If that continues and the suppliers continue to deliver, Motorsport Valley looks set to remain home to much of the F1 fraternity for many years to come. Can Sebastian Vettel be stopped at Silverstone? Read more on British Grand Prix: Can Sebastian Vettel be stopped at Silverstone?